Scroll down to see all the patterns, or use the quick links to the left. More photos may be found at the Gallery. "Harry's Heart" is in honor of my grandfather, who had a brave and wonderful heart. This shawl was created piece by piece, and assembled by stitching all the piecse together for a plaid look. The central panel is a Celtic knot pattern I modified and called, "Two Hearts Connected." 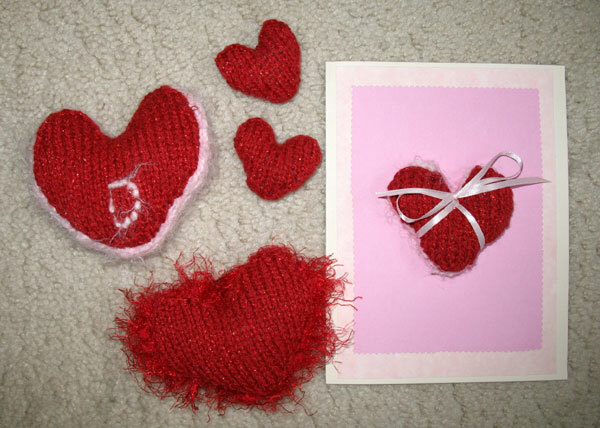 The decorative tan pieces, which I call "mini hearts," were made with yarn-overs, and the remaining squares were made using the diagonal and right-angle methods. By Erica. Finished size: 24 x 76"
Repeat rows 2&3, adding one knit stitch before and after the YO sequence (i.e., K2..K2, K3...K3), until there are 37 stitches on the needles. Cast off loosely (especially in the corner). Block to form a square. Cast off wrong side, tightly. 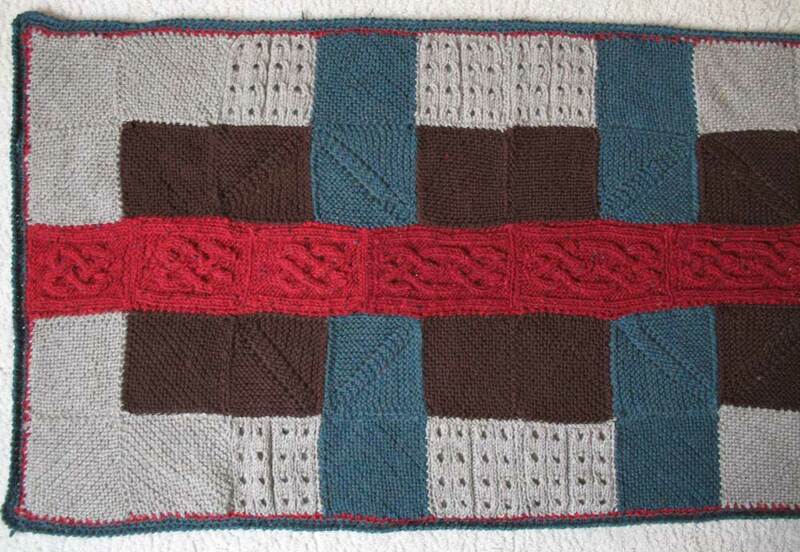 This is from Ivanova & Carter's Celtic Knot Project-- great patterns! Cast off tightly after last row of pattern. Work pattern rows 1 - 10, and 25 - 34. "Poppies" is plush and warm! By Evelyn "The Master"
It took about 6 small skeins from the dollar store. Finished size: 21 x 65"
Knit the garter stitch until the piece measures about 62 inches in length. 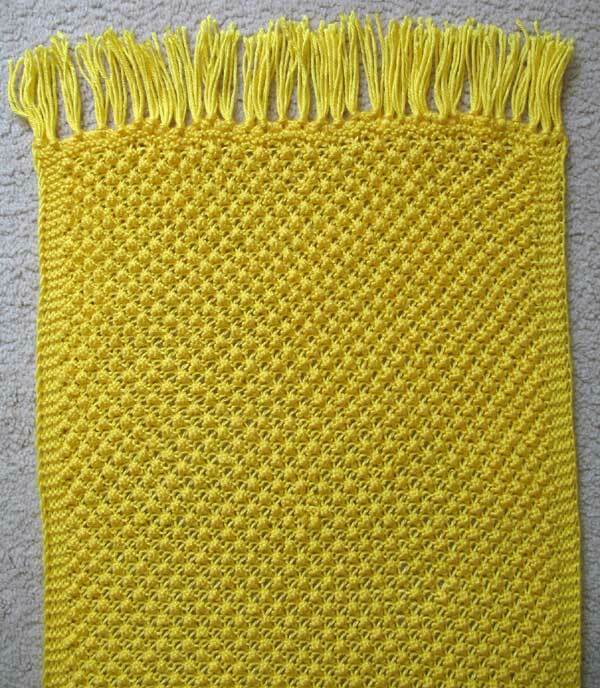 Finish with a crochet border: single crochet stitches, stitching every 6th stitch to shawl to form loops. As bright and warm as sunshine! 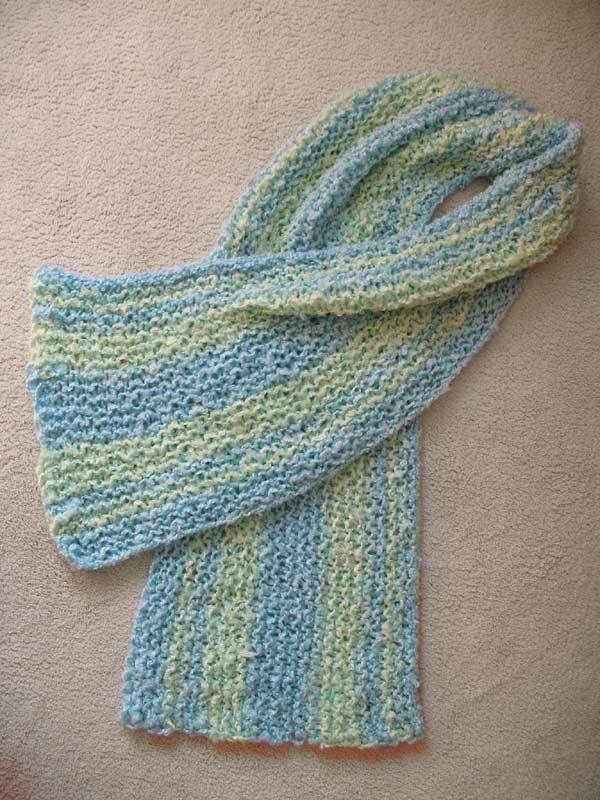 By Evelyn "The Master"
Finished size: 18 x 61"
Knit the garter stitch for the first 3 rows. Garter final 4 rows, cast off loosely. This fun shawl is in honor of my grandmother. We could always count on her for laughter and joy in life. I think maybe my grandmother loved to play with her grandchildren as much as we loved playing with her. 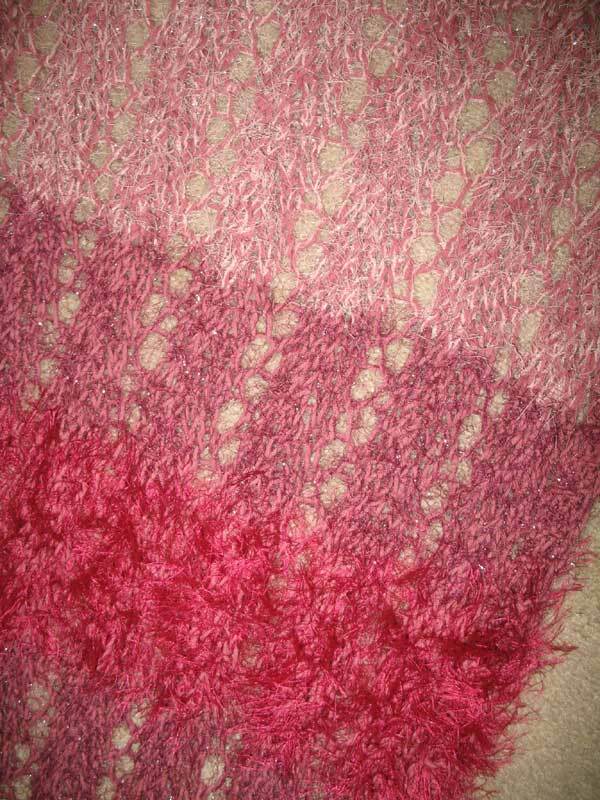 Based on the Hestia shawl (pdf) from The Knitting Pen. Used Cotton Ease throughout, doubling up with Silverlash and Fun Fur. By Erica. Finished size: 24 x 71"
Row 1: k3, * yo, k2, k2 tog, k2* repeat from * to * to last 3 sts, k3. Row 2 and 4: k3, purl to last 3 sts, k3. Row 3: k3, * k2, k2 tog, k2, yo* repeat from * to * to last 3 sts, k3. Knit the garter stitch for five rows. Some of my fondest memories of my paternal grandfather are the two of us fishing the green-blue waters of Turkeyfoot Lake and riding in his beautiful little Chris Craft. I don't think we ever caught a whole lot, but we sure had fun. This shawl was a venture into knitting horizontally and it came out a lot longer than anticipated! The length makes it great for wrapping around or doubling up for extra warmth. A quick knit with fluffy yarn and extra large needles. By Erica. Finished size: 18 x 90"
Cast on 118 and garter stitch the long rows as follows:. This Seva shawl was created in honor of Devotion...an offering of the self. By Gabrielle. 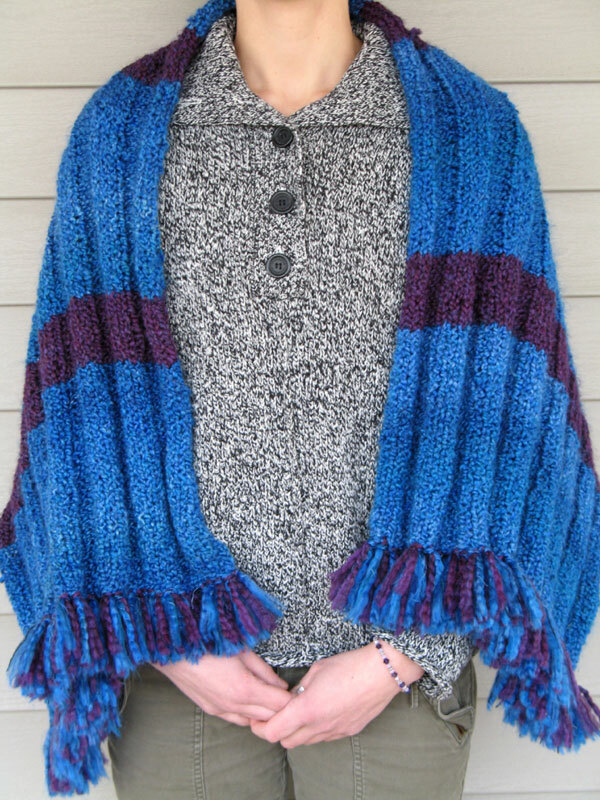 It was made by knitting a double strand: one being a multicolor acrylic yarn (2 skeins), and the other a solid "soft boucle" polyester/acrylic blend (2+ skeins). Finished size: 28 x 60"
Multicolor: Red Heart, 0318 Watercolor, approx. 600yds. 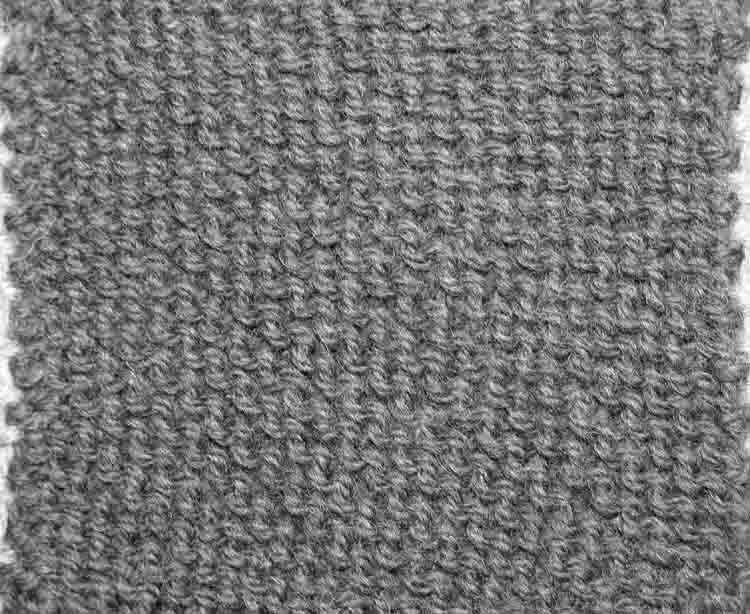 Boucle: Bernat Soft Boucle, 26928 Grey Shades, approx. 550 yds. 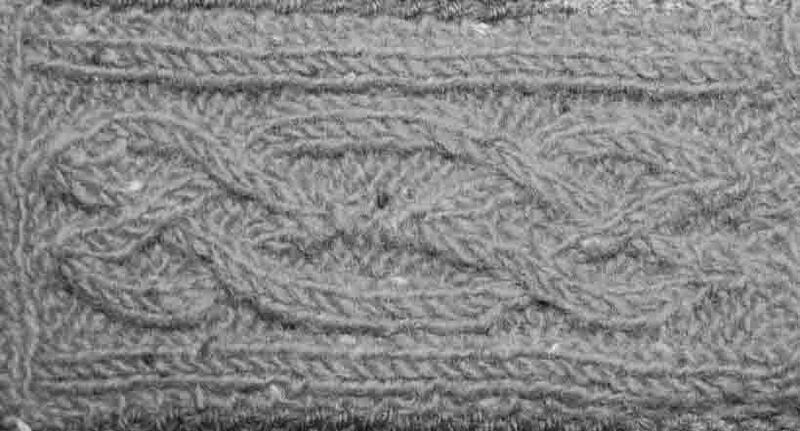 Cast on 60, using a double strand made of one strand from each yarn. Knit the garter stitch until the piece measures 10 inches in length. 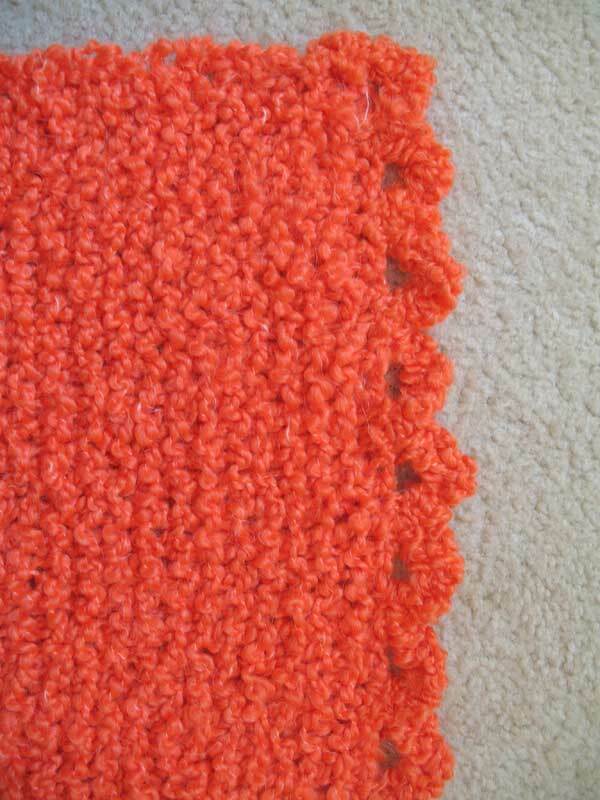 Continue with the stockinette stitch until the piece measures 50 inches in length. Finish with the garter stitch until the piece reaches 60 inches. Add fringe to the short edges with the multicolor yarn. Made in honor of my grandmother, Margaret Lee Smith, who taught me patience by her example. By Erica. Finished size: 21.5 x 63"
nearly 3 skeins, approx. 600 yds. Color 2: Ella Rae Classic Romanian wool, Color 43, 1 skein, approx. 200 yds. Cast on 80 in C2. 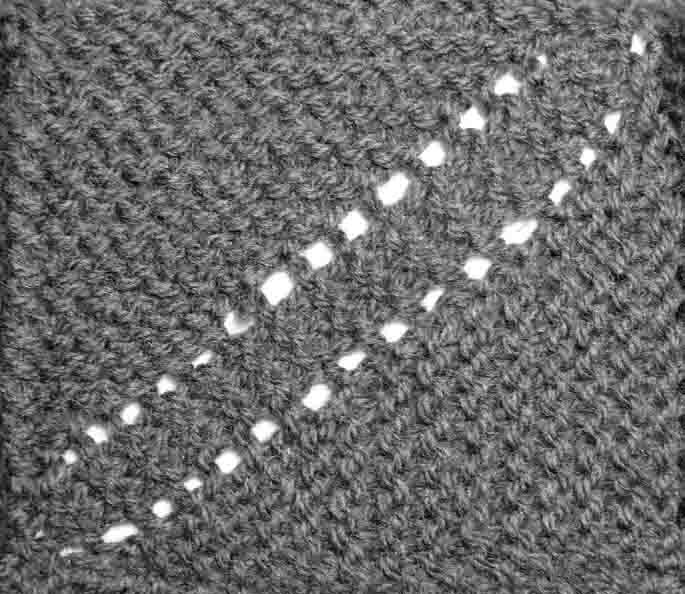 Note: Slip first stitch each row for a finished edge, count as K1. [Seed stitch for 22 rows. Seed stitch (K P) for 22 rows. 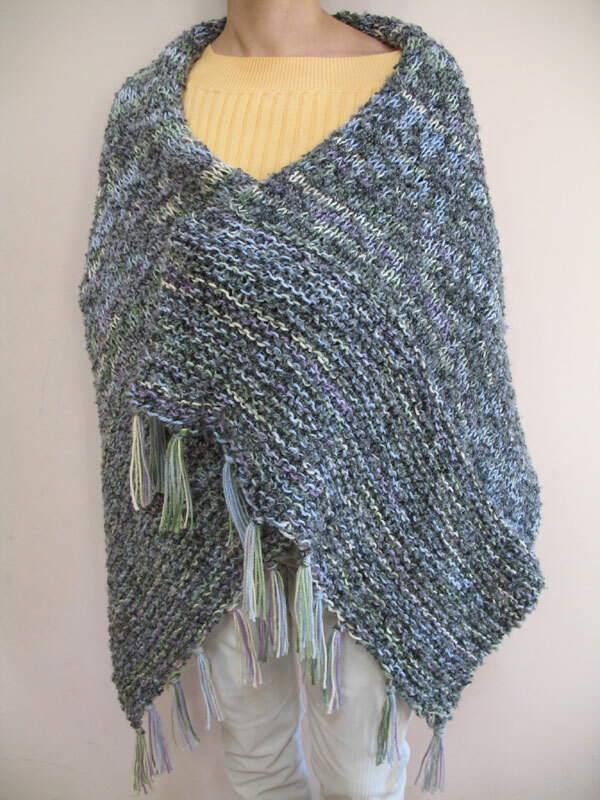 A soft and cozy shawl with a pleated texture. By Erica. Finished size: 26 x 50"
MC: Lionbrand Homespun, 368 Montana Sky, approx. 333 yds. Cast on 60 sts MC. Row 2: (k4, p4) 7 times, k4. Row 3: (p4, k4) 7 times, p4. Cast off all stitches loosely. Add fringe of desired length, using one strand MC and C1 for each tassel. Wash and block. 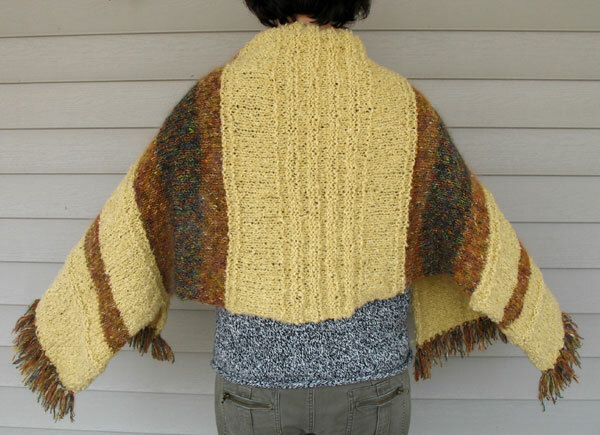 A shawl like a cuddly, plush lion with a shimmering mane. The Moonlight Mohair was on sale, so I couldn't resist! As a beginner, I found the Boucle difficult to work with, as it was hard to distinguish between knit and purl stitches. It did get easier after a while, and the Boucle made nice, subtle textures when reversing the stockinette stitch. By Erica. Finished size: 20 x 62"
MC: Bernat Soft Boucle, Softest Straw, approx. 300 yds. C1: Lionbrand Moonlight Mohair, Safari, approx. 160 yds. C2: Lionbrand Moonlight Mohair, Rainforest, approx. 90 yds. 23 rows Stockinette st (i.e., knit odd rows / right side, purl even rows / wrong side). Add fringe of desired length, using two strands each of C2 and C3 for each tassel. Wash and block. Using C2, cast on 70 sts. Work in garter st for approx. 1/2". Change to MC, work in garter stitch 2 more rows. Next Row: (k4, inc 1 st in next st), repeat to the last 5 sts, k5. 83 sts. Continue garter st until piece measures 5". Row 2 and every other row: Knit. Row13: K2tog repeat to last st, k1. Repeat Row 13 till 5sts remain. Break off yarn leaving enough to thread last 5 sts, And sew up back seam. Roll or Fold up brim. Tassel: Make 3 strands of chain stitch approx. 5" long. Tie off ends. Fold in half and tightly wrap a piece of yarn around the tassel about 1/2" below the top and tie securely, trim ends. Sew tassel to top of cap. Beginning at back, work in garter st for 26 rows, changing colors each row: C2 6 sts, MC 36 sts, C2 6 sts. Fold bootie in half. Weave front and back seams. Fold down top to form cuff. Fun little gifts for your sweetie. Quick and easy, a great way to learn increases and decreases. Repeat the above pattern for opposite side of heart. Weave in loose ends. With wrong sides facing each other, sew up the two heart pieces, stuffing with polyfill before making the last few stitches. 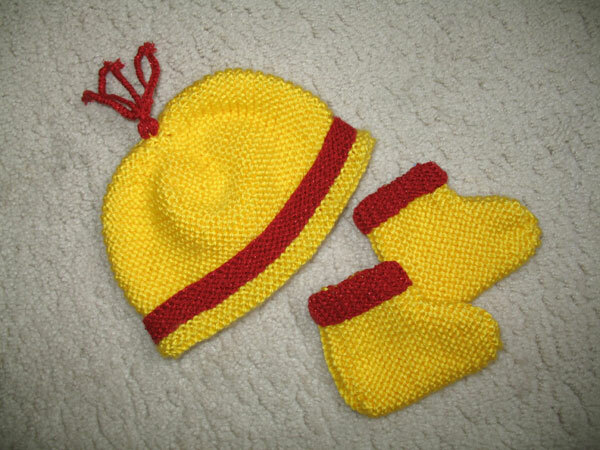 Used various yarns, mixing and matching front and back pieces and for decorating with duplicate stitches. Row 1: (and all uneven rows): (WS) purl. Row 2: k1, m1, k1, m1, k1. Row 4: *k1, m1, repeat from * to last stitch, k1. Row 6: k1, m1, knit to last stitch, m1, k1. Row 8: k1, m1, k1, m1, knit to last 2 stitches, m1, k1, m1, k1. Row 10-16: Repeat Row 6. Row 18-22: Knit all stitches. 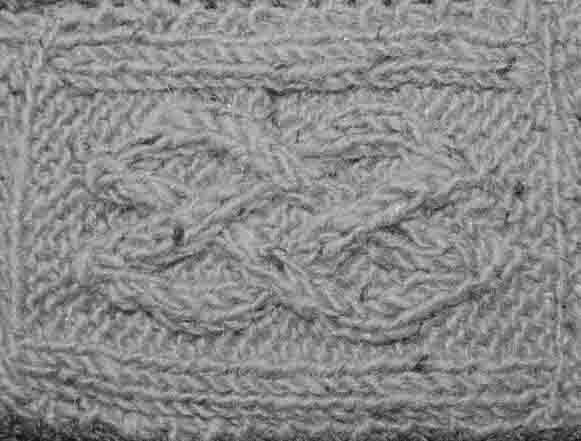 Row 26: Knit all 9 stitches (all the stitches on the right side of the heart). Row 28: k1, ssk, k3, k2tog, k1. Row 30: ssk, slip 1, k2tog, psso, k2tog. Row 32: Cast off 3. 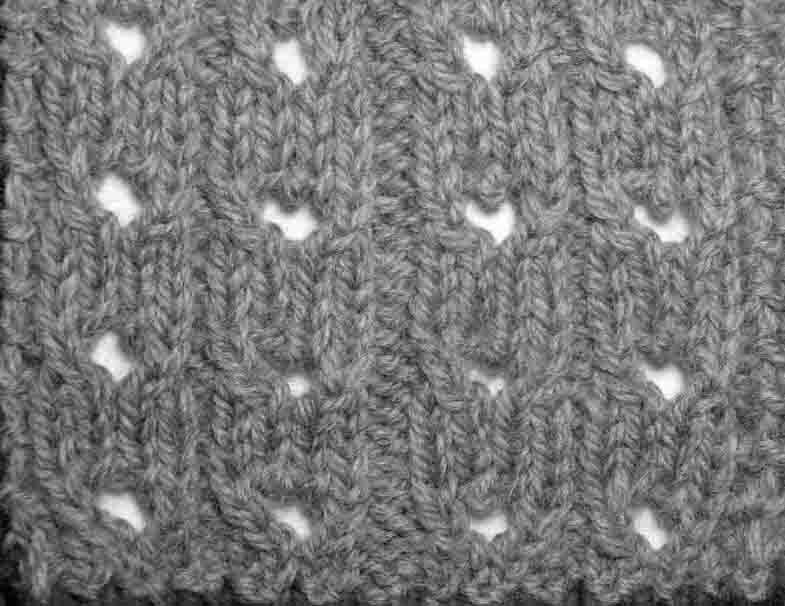 Repeat Rows 24-32 for the other side of the top of the heart.